A largely musing post today to consider the Olympics, as the 2012 London Summer Games are underway. Not being a subscriber to cable television and sadly unable to obtain a digital signal for the local station's broadcast (few in my region of the San Francisco Bay Area are able to do so), I've been more or less out of the loop on the 2012 Olympics so far, with the exception of newspaper articles, a fleeting glimpse of the Opening Ceremonies online, and a bit of time spent watching swimming and gymnastics events with family last night. What I love about the Olympics is the ideal of common humanity and the celebration of athleticism in so many forms that the Games bring us every four years in Winter and Summer. For our ghosts of 1914, there were no Olympic Games during the war. After 1912's Games in Stockholm, Sweden, the 1916 Olympics, which had been scheduled prior to the war to take place in Berlin, Germany, were cancelled. The war cast a huge shadow over the Games, one that did not lift until the 1920 Antwerp, Belgium Summer Olympics. This Olympiad was awarded to the war-torn city as a way of initiating a healing process after Armistice. However, it appears that considerable tension remained, and several nations (including Germany, Austria, Bulgaria, and Turkey) were not invited to participate. On a lighter note, I found that the 1920 Games included medals for Tug-of-War, which I had not previously realized was an Olympic sport! Tug-of-War lasted from 1900-1920 at the Olympics. Thinking about the Olympics as having some healing power after the international crisis of the First World War brings to my mind one of my (top two or three) favorite films: 1981's Chariots of Fire (for interested parties, the film has been re-mastered and re-released in time for the 2012 Games). Depicting the story of the British runners who went to the 1924 Paris Olympics, this film captures one of many pivotal moments in Olympic history. Chariots of Fire opens with scenes of solemn memorial--a contemporary funeral service gives way to memories of 1920s Cambridge, where young men just entering the University pay homage to other young Cambridge men, just a few years older than themselves, who have died in the war. Another sequence shows us two war veterans, one with an extensive facial prosthetic, helping two future members of the Olympic team into a cab as they arrive to begin their University education. The two veterans look resentfully at their only slightly younger peers, considering the toll they have paid so that these more privileged (both in age and presumably in financial status) men can enjoy the civilian life, saved by time and circumstance from the realities of the Front. 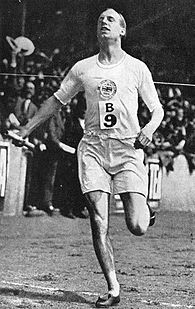 Eric Liddell at the 1924 Games. While it recognizes the still-painful historical context of a post-war Olympiad, Chariots of Fire celebrates the more universal Olympic ideals of athleticism, teamwork, and personal triumph over various challenges. When we watch the runners sprinting around the track or racing along a windy beach, there is something compellingly pure about their movement and their engagement with their sport--it is as though nothing else exists and nothing else matters. Of course, it is not the case that nothing else really matters or exists--this is not the reality that the Olympics, or a film like Chariots of Fire, reflect. Rather, they offer an important reminder that, in spite of all else that does matter and affect us, in our daily lives or on a global scale, transcendence is possible. Regardless of our personal athleticism (or our possession or lack of a cable television subscription), we all have access to this truth. "Dream Voices: Sassoon, Memory, and War." I will continue regular posts of "link soup": tidbits that I find in my excursions on the web while doing research. If you'd like to receive soup in smaller, more "real time"-like servings, then follow "Ghosts of 1914" on Twitter, where I post individual findings quite often. The above poster balances the rather bubbly title of its featured production, which seems guaranteed to be light-hearted and pleasant, with the firm anchoring language of its notice about the theater housing "A Little Bit of Fluff" being "entirely underground" and thus impervious to air-raids (or so it might be hoped). After the recent movie theater tragedy in Aurora, Colorado, I have noticed many news articles that ponder, to varying degrees, the horrible irony of a place that we associate with joy, magic, and escapism becoming a site of all-too-real suffering and destruction. There is not a good way to sum up such thoughts or to place them in some kind of critical container that allows us to regard the events and what they seem to mean to us objectively or rationally, really. From a human perspective, this is incomprehensible and frightening. But these documents of another time when the theater existed amidst serious fears and very real tragedy are perhaps especially worthy of contemplation at the present. Today I'm continuing some important chapter revisions, focusing on Siegfried Sassoon's fictionalized memoirs (known sometimes as the Sherston Trilogy), which make for an excellent read. But I started the morning in my little patio garden, tending to my plants. I've managed to coax nasturtiums, lavender, thyme, "microgreens" (fancy lettuce sprouts), and heliotrope to sprout over the last few months. It is a soothing pastime. It brought me to peruse the IWM's collections database for images related to gardens from the First World War era. Bainbrigge's watercolor shows an extensive encampment in Kensington Gardens, London. The crisp white tents stand out along the water's edge. There's something about the way she hyphenates "war-time" in her title that suggests to me a tentativeness, the slight awkwardness of the new--as though when we walk in a pair of just-bought shoes for the first time. Perhaps it's just my imagination, but as a close reader by trade, these little details really strike me. The 1914 date of the sketch certainly indicates that the image comes from the first few months of war, so the sense of slightly uncomfortable newness about "war-time" is supported. Anyway, I'm wondering if Bainbrigge's image depicts a training camp established in the park and/or something related to the famously strange "Exhibition Trenches" dug in Kensington Gardens to show the civilian populace what trench life was like. It isn't difficult to guess that these trenches were far too ideal, far too neat and tidy, to reflect much of their actual counterparts. In fact, Paul Fussell writes that Wilfred Owen declared them to be "the laughing stock of the army" (Fussell, 49). Succinctly, Fussell says, "[t]he reality was different" (49). Though for the ghosts of 1914 the Kensington Trenches were a blatant example of the imaginary failing to meet the real, gardens, like many projects, always do mix a bit of the actual and the ideal--we hope for and picture a hearty, vibrant, patch of greenery though our tender leaves and scrawny stems may not exactly match this vision. Gardens plant the gardener firmly in reality, toiling and tending each day as we inch nearer the verdant Ardens of our imagining. "142 Years Young and Going Strong!" ca. 1917-19. National Archives, Item 512445. A brief post to mark Independence Day in the U.S. On July 4th, 1918, the United States had been involved in the Great War for several months and would continue its engagement until Armistice. Many felt that America's entry into the war, though it came after three years of strife, was pivotal in bringing this terrible conflict to an end. Vera Brittain, one of my recent research subjects, recorded a feeling of elation and relief upon seeing American soldiers arriving in France. Indeed, the above poster celebrates Uncle Sam's 142nd birthday and promotes--quite energetically--the image of a brave, agile, nation charging to victory on the battlefield. We feel confident in this nimble, fearless, Uncle Sam. Happy July 4th to you, dear readers. I hope you have a chance to celebrate the holiday, to thank our veterans of yesterday and today, and to make a wish for peaceful enjoyment of everything that freedom means to you.